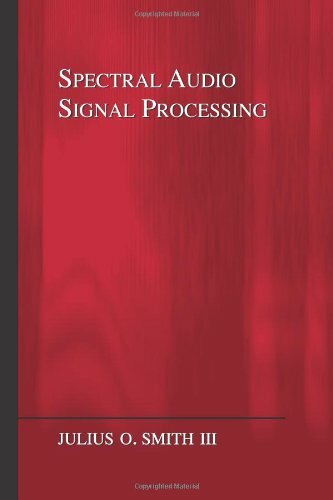 This appendix surveys some of the highlights of developments in spectral audio signal processing, beginning with Daniel Bernoulli's original understanding of acoustic vibration as a superposition of sinusoidally vibrating modes and progressing through more recent history in spectral modeling of audio signals. A complete history of audio spectral models would be a very large undertaking. Instead, this appendix offers a sequence of what the author considers to be interesting and important topics in more or less chronological order. Note that organ builders had already for centuries built machines for performing a kind of ``additive synthesis'' by gating various ranks of pipes using ``stops'' as in pipe organs found today. However, the waveforms mixed together were not sinusoids, and were not regarded as mixtures of sinusoids. Theories of sound at that time, based on the ideas of Galileo, Mersenne, and Sauveur, et al. , were based on time-domain pulse-train analysis. That is, an elementary tone at a fixed pitch (and fundamental frequency) was a periodic pulse train, with the pulse-shape being non-critical. Musical consonance was associated with pulse-train coincidence--not frequency-domain separation. Bernoulli clearly suspected the spectrum analysis function integral to hearing as well as color perception [52, p. 359], but the concept of the ear as a spectrum analyzer is generally attributed to Helmholtz (1863) . Figure G.1: Telharmonium rheotomes, forerunners of the Hammond Organ tone wheels. 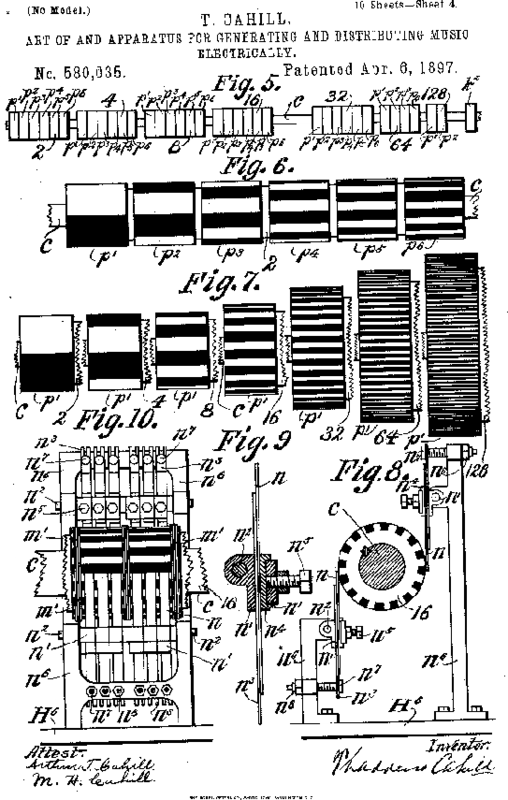 Sound was generated electromechanically in the Telharmonium by so-called rheotomes, depicted in Figures G.1 and G.2 from the patent. A rheotome was a spinning metal shaft with cut-outs that caused a periodic electrical signal to be picked up by capacitive coupling. The rheotome is a clear forerunner of the Hammond organ tone wheels, shown in Fig.G.3. Because rheotomes did not generate sinusoidal components, the Telharmonium is better considered an electromechanical descendant of the pipe organ than as an ``additive synthesis'' device in the modern sense (i.e., inspired by Bernoulli's modal decomposition insight and Fourier's famous theorem). However, the Hammond organ was conceptually an additive synthesis device (having drawbars on individual overtones), and it was clearly influenced by the Telharmonium. The Hammond organ was introduced in US Patent 1,956,350. A difference between the Hammond organ and Telharmonium is that Telharmonium tones were something like ``bandlimited square wave'' tones (see Fig.G.1), while the Hammond organ tone wheels were carefully machined to provide nearly sinusoidal components. Thus, the Hammond organ truly classifies as an ``additive synthesis device'' (§G.8). It has survived essentially intact to the present day, and has been extensively simulated electronically (e.g., in Korg synthesizers). Figure G.3: Tone Wheels of the Hammond Organ. The Voder was a manually driven speech synthesizer developed by Homer Dudley at Bell Telephone Laboratories. Details are described in US Patent 2,121,142 (filed 1937). The Voder was demonstrated at the 1939 World's Fair. The voder was manually operated by trained technicians.G.6Pitch was controlled by a foot pedal, and ten fingers controlled the bandpass gains. Buzz/hiss selection was by means of a wrist bar. Three additional keys controlled transient excitation of selected filters to achieve stop-consonant sounds . ``Performing speech'' on the Voder required on the order of a year's training before intelligible speech could reliably be produced. The Voder was a versatile performing instrument having intriguing possibilities well beyond voice synthesis. Additive synthesis (now more often called ``sinusoidal modeling'') was one of the first computer-music synthesis methods, and it has been a mainstay ever since. In fact, it is extensively described in the first article of the first issue of the Computer Music Journal . Some of the first high-quality synthetic musical instrument tones using additive synthesis were developed in the 1960s by Jean-Claude Risset at AT&T Bell Telephone Laboratories [233,232]. Additive synthesis was historically implemented using a sum of sinusoidal oscillators modulated by amplitude and frequency envelopes over time , and later using an inverse FFT [35,239] when the number of sinusoids is large. 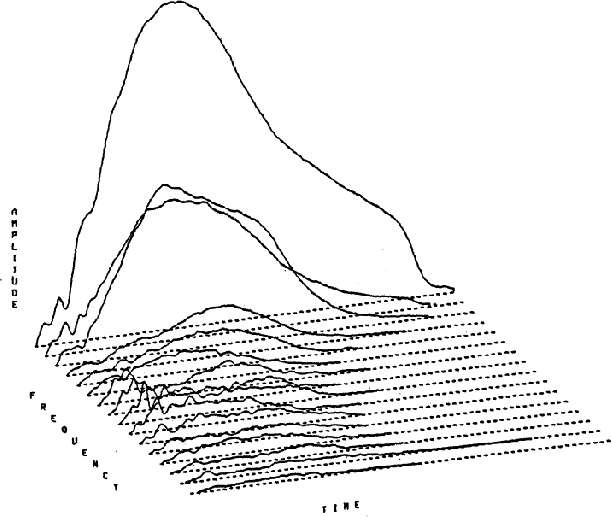 Figure G.5 shows an example from John Grey's 1975 Ph.D. thesis (Psychology) illustrating the nature of partial amplitude envelopes computed for purposes of later resynthesis. When the number of partial overtones is large, an explicit sinusoidal oscillator bank requires a significant amount of computation, and it becomes more efficient to use the inverse FFT to synthesize large ensembles of sinusoids [35,239,143,142,139]. This method gives the added advantage of allowing non-sinusoidal components such as filtered noise to be added in the frequency domain [246,249]. Inverse-FFT (IFFT) synthesis was apparently introduced by Hal Chamberlin in his classic 1980 book ``Musical Applications of Microprocessors'' . His early method consisted of simply setting individual FFT bins to the desired amplitude and phase, so that an inverse FFT would efficiently synthesize a sum of fixed-amplitude, fixed-frequency sinusoids in the time domain. This idea was extended by Rodet and Depalle  to include shaped amplitudes in the time domain. Instead of writing isolated FFT bins, they wrote entire main lobes into the buffer, where the main lobes corresponded to the desired window shape in the time domain.G.7 (Side lobes of the window transform were neglected.) They chose the triangular window ( main-lobe shape), thereby implementing a linear cross-fade from one frame to the next in the time domain. A remaining drawback of IFFT synthesis was that inverse FFTs generate sinusoids at fixed frequencies, so that a rapid glissando may become ``stair-cased'' in the resynthesis, stepping once in frequency per output frame. An extension of IFFT synthesis to support linear frequency sweeps was devised by Goodwin and Kogon . The basic idea was to tabulate window main-lobes for a variety of sweep rates. (The phase variation across the main lobe determines the frequency variation over time, and the width of the main lobe determines its extent.) In this way, frequencies could be swept within an FFT frame instead of having to be constant with a cross-fade from one static frame to the next. Independently of Goodwin and Kogon, Marques and Almeida introduced chirplet modeling of speech in 1989 . This technique is based on the interesting mathematical fact that the Fourier transform of a Gaussian-windowed chirp remains a Gaussian pulse in the frequency domain (§10.6). Instead of measuring only amplitude and phase at each a spectral peak, the parameters of a complex Gaussian are fit to each peak. The (complex) parameters of each Gaussian peak in the spectral model determine a Gaussian amplitude-envelope and a linear chirp rate in the time domain. Thus, both cross-fading and frequency sweeping are handled automatically by the spectral model. A specific method for carrying this out is described in §10.6. More recent references on chirplet modeling include [197,90,91,89]. Beginning in 1999, Laroche and Dolson extended IFFT synthesis (§G.8.1) further by using raw spectral-peak regions from STFT analysis data [143,142,139]. By preserving the raw spectral peak (instead of modeling it mathematically as a window transform or complex Gaussian function), the original amplitude envelope and frequency variation are preserved for the signal component corresponding to the analyzed peak in the spectrum. To implement frequency-shifting, for example, the raw peaks (defined as ``regions of influence'' around a peak-magnitude bin) are shifted accordingly, preserving the original amplitude and phase of the FFT bins within each peak region. We have already mentioned inverse-FFT synthesis as a means of greatly decreasing the cost of additive synthesis relative to a full-blown bank of sinusoidal oscillators. This section summarizes a number of more specialized methods which reduce the computational cost of additive synthesis and are widely used. Note that sometimes the term ``wavetable synthesis'' is used to refer to what was originally called sampling synthesis: playback of sampled tones from memory, with looping of the steady-state portion to create an arbitrarily long sustain [165,27,107,193]. This book adheres to the original terminology. For sampling synthesis, spectral phase-modifications (Chapter 8) can be used to provide perfectly seamless loops . The basic idea of group-additive synthesis [130,69] is to employ a set of wavetables, each modeling a harmonic subset of the tonal components making up the overall spectrum of the synthesized tone. Since each wavetable oscillator is independent, inharmonic sounds can be synthesized to some degree of approximation, and the amplitude envelopes are not completely locked together. It is important to be aware that human audio perception cannot tell the difference between harmonic and inharmonic partials at high frequencies (where ``high'' depends on the fundamental frequency and timbre to some extent). Thus, group-additive synthesis provides a set of intermediate points between wavetable synthesis and all-out additive synthesis. For more about the history of additive synthesis, see the chapter on ``Sampling and Additive Synthesis'' in . For ``hands-on'' introductions to additive synthesis (with examples in software), see  (pd),  (Csound ), or  (cmusic). A discussion of the phase vocoder in conjunction with additive synthesis begins in §G.10. The first commercial digital sound synthesis method was Frequency Modulation (FM) synthesis [38,41,39], invented by John Chowning, the founding director of CCRMA. FM synthesis was discovered and initially developed in the 1970s . The technology was commercialized by Yamaha Corporation, resulting in the DX-7 (1983), the first commercial digital music synthesizer, and the OPL chipset, initially in the SoundBlaster PC sound card, and later a standard chipset required for ``SoundBlaster compatibility'' in computer multimedia support. 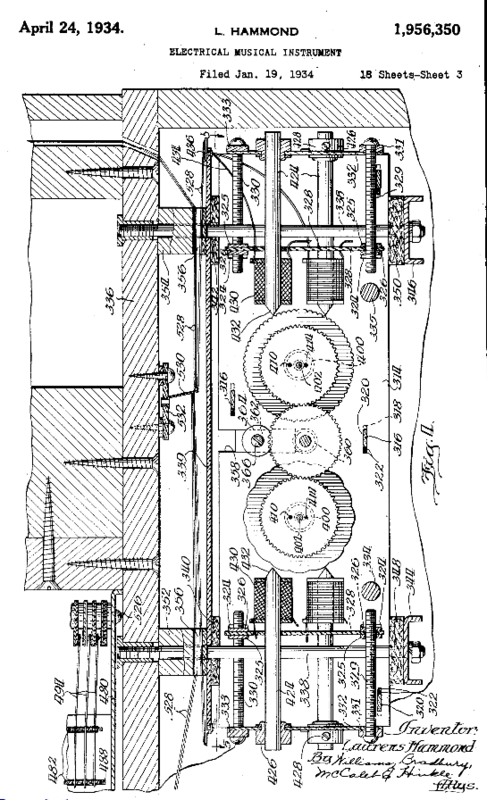 The original pioneer patent expired in 1996, but additional patents were filed later. It is said that this technology lives on in cell-phone ring-tone synthesis. An example computer-music-style diagram is shown in Fig.G.6. Since the instantaneous frequency of a sinusoid is simply the time-derivative of its instantaneous phase, FM can also be regarded as phase modulation (PM). It is highly remarkable that such a simple algorithm can generate such a rich variety of musically useful sounds. This is probably best understood by thinking of FM as a spectral modeling technique, as will be illustrated further below. Figure G.6: Simple FM brass synthesis. FM bandwidth expands as the modulation-amplitude is increased in (G.2) above. The th harmonic amplitude is proportional to the th-order Bessel function of the first kind , evaluated at the FM modulation index . Figure G.7 illustrates the behavior of : As is increased, more power appears in the sidebands, at the expense of the fundamental. Thus, increasing the FM index brightens the tone. Figure: Bessel functions of the first kind for a range of orders (harmonic numbers) and argument (FM index) (from ). Jean-Claude Risset observed (1964-1969), based on spectrum analysis of brass tones , that the bandwidth of a brass instrument tone was roughly proportional to its overall amplitude. In other words, the spectrum brightened with amplitude. This observation inspired John Chowning's FM brass synthesis technique (starting in 1970). For FM brass, the FM index is made proportional to carrier amplitude, thus yielding a dynamic brightness variation with amplitude that sounds consistently ``brassy''. A simple example of an FM brass instrument is shown in Fig.G.6 above. Note how the FM index is proportional to the amplitude envelope (carrier amplitude). 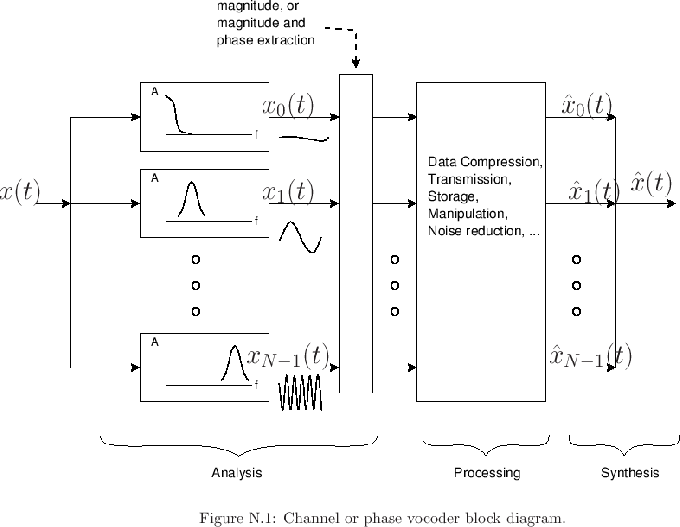 FM voice synthesis  can be viewed as compressed modeling of spectral formants. Figure G.8 shows the general idea. This kind of spectral approximation was used by John Chowning and others at CCRMA in the 1980s and beyond to develop convincing voices using FM. Another nice example was the FM piano developed by John Chowning and David Bristow . Figure G.8: FM voice synthesis. A basic FM operator, consisting of two sinusoidal oscillators (a ``modulator'' and a ``carrier'' oscillator, as written in Eq. (G.2)), can synthesize a useful approximation to a formant group in a harmonic line spectrum. In this technique, the carrier frequency is set near the formant center frequency, rounded to the nearest harmonic frequency, and the modulating frequency is set to the desired pitch (e.g., of a sung voice ). The modulation index is set to give the desired bandwidth for the formant group. For the singing voice, three or more formant groups yields a sung vowel sound. Thus, a sung vowel can be synthesized using only six sinusoidal oscillators using FM. In straight additive synthesis, a bound on the number of oscillators needed is given by the upper band-limit divided by the fundamental frequency, which could be, for a strongly projecting deep male voice, on the order of kHz divided by 100 Hz, or 200 oscillators. Today, FM synthesis is still a powerful spectral modeling technique in which ``formant harmonic groups'' are approximated by the spectrum of an elementary FM oscillator pair. This remains a valuable tool in environments where memory access is limited, such as in VLSI chips used in hand-held devices, as it requires less memory than wavetable synthesis (§G.8.4). In the context of audio coding, FM synthesis can be considered a ``lossy compression method'' for additive synthesis. For further reading about FM synthesis, see the original Chowning paper , paper anthologies including FM [236,234], or just about any computer-music text [235,183,60,216]. As mentioned in §G.7, the phase vocoder had become a standard analysis tool for additive synthesis (§G.8) by the late 1970s [186,187]. This section summarizes that usage. In analysis for additive synthesis, we convert a time-domain signal into a collection of amplitude envelopes and frequency envelopes (or phase modulation envelopes ), as graphed in Fig.G.12. It is usually desired that these envelopes be slowly varying relative to the original signal. This leads to the assumption that we have at most one sinusoid in each filter-bank channel. (By ``sinusoid'' we mean, of course, ``quasi sinusoid,'' since its amplitude and phase may be slowly time-varying.) The channel-filter frequency response is given by the FFT of the analysis window used (Chapter 9). The analysis and synthesis signal models are summarized in Fig.G.9. Figure G.9: Illustration of channel vocoder parameters in analysis (left) and synthesis (right). To compute the amplitude at the output of the th subband, we can apply an envelope follower. Classically, such as in the original vocoder, this can be done by full-wave rectification and subsequent low pass filtering, as shown in Fig.G.10. This produces an approximation of the average power in each subband. We call the instantaneous amplitude at time for both and . The function as a whole is called the amplitude envelope of the th channel output. The instantaneous phase at time is , and its time-derivative is instantaneous frequency. In order to determine these signals, we need to compute the analytic signal from its real part . Ideally, the imaginary part of the analytic signal is obtained from its real part using the Hilbert transform (§4.6), as shown in Fig.G.11. Since the th channel of an -channel uniform filter-bank has nominal bandwidth given by , the frequency deviation usually does not exceed . Initially, the sliding FFT was used (hop size in the notation of Chapters 8 and 9). Larger hop sizes can result in phase ambiguities, i.e., it can be ambiguous exactly how many cycles of a quasi-sinusoidal component occurred during the hop within a given channel, especially for high-frequency channels. In many applications, this is not a serious problem, as it is only necessary to recreate a psychoacoustically equivalent peak trajectory in the short-time spectrum. For related discussion, see . Using (G.6) and (G.14) to compute the instantaneous amplitude and frequency for each subband, we obtain data such as shown qualitatively in Fig.G.12. A matlab algorithm for phase unwrapping is given in §F.4.1. Using the phase-vocoder to compute amplitude and frequency envelopes for additive synthesis works best for quasi-periodic signals. For inharmonic signals, the vocoder analysis method can be unwieldy: The restriction of one sinusoid per subband leads to many ``empty'' bands (since radix-2 FFT filter banks are always uniformly spaced). As a result, we have to compute many more filter bands than are actually needed, and the empty bands need to be ``pruned'' in some way (e.g., based on an energy detector within each band). The unwieldiness of a uniform filter bank for tracking inharmonic partial overtones through time led to the development of sinusoidal modeling based on the STFT, as described in §G.11.2 below. Another limitation of the phase-vocoder analysis was that it did not capture the attack transient very well in the amplitude and frequency envelopes computed. This is because an attack transient typically only partially filled an STFT analysis window. Moreover, filter-bank amplitude and frequency envelopes provide an inefficient model for signals that are noise-like, such as a flute with a breathy attack. These limitations are addressed by sinusoidal modeling, sines+noise modeling, and sines+noise+transients modeling, as discussed starting in §10.4 below (as well as in §10.4). The phase vocoder was not typically implemented as an identity system due mainly to the large data reduction of the envelopes (piecewise linear approximation). However, it could be used as an identity system by keeping the envelopes at the full signal sampling rate and retaining the initial phase information for each channel. Instantaneous phase is then reconstructed as the initial phase plus the time-integral of the instantaneous frequency (given by the frequency envelope). As introduced in §10.4, Spectral Modeling Synthesis (SMS) generally refers to any parametric recreation of a short-time Fourier transform, i.e., something besides simply inverting an STFT, or a nonparametrically modified STFT (such as standard FFT convolution).G.11 A primary example of SMS is sinusoidal modeling, and its various extensions, as described further below. The Fourier duality of the overlap-add and filter-bank-summation short-time Fourier transform (discussed in Chapter 9) appeared in the late 1970s [7,9]. This unification of downsampled filter-banks and FFT processors spawned considerable literature in STFT processing [158,8,219,192,98,191]. While the phase vocoder is normally regarded as a fixed bandpass filter bank. The STFT, in contrast, is usually regarded as a time-ordered sequence of overlapping FFTs (the ``overlap-add'' interpretation). Generally speaking, sound reconstruction by STFT during this period was nonparametric. A relatively exotic example was signal reconstruction from STFT magnitude data (magnitude-only reconstruction) [103,192,219,20]. In the speech-modeling world, parametric sinusoidal modeling of the STFT apparently originated in the context of the magnitude-only reconstruction problem . Since the phase vocoder was in use for measuring amplitude and frequency envelopes for additive synthesis no later than 1977,G.12it is natural to expect that parametric ``inverse FFT synthesis'' from sinusoidal parameters would have begun by that time. Instead, however, traditional banks of sinusoidal (and more general wavetable) oscillators remained in wide use for many more years. Inverse FFT synthesis of sound was apparently first published in 1980 . Thus, parametric reductions of STFT data (in the form of instantaneous amplitude and frequency envelopes of vocoder filter-channel data) were in use in the 1970s, but we were not yet resynthesizing sound by STFT using spectral buffers synthesized from parameters. With the phase vocoder, the instantaneous amplitude and frequency are normally computed only for each ``channel filter''. A consequence of using a fixed-frequency filter bank is that the frequency of each sinusoid is not normally allowed to vary outside the bandwidth of its channel bandpass filter, unless one is willing to combine channel signals in some fashion which requires extra work. Ordinarily, the bandpass center frequencies are harmonically spaced. I.e., they are integer multiples of a base frequency. So, for example, when analyzing a piano tone, the intrinsic progressive sharpening of its partial overtones leads to some sinusoids falling ``in the cracks'' between adjacent filter channels. This is not an insurmountable condition since the adjacent bins can be combined in a straightforward manner to provide accurate amplitude and frequency envelopes, but it is inconvenient and outside the original scope of the phase vocoder (which, recall, was developed originally for speech, which is fundamentally periodic (ignoring ``jitter'') when voiced at a constant pitch). Moreover, it is relatively unwieldy to work with the instantaneous amplitude and frequency signals from all of the filter-bank channels. For these reasons, the phase vocoder has largely been effectively replaced by sinusoidal modeling in the context of analysis for additive synthesis of inharmonic sounds, except in constrained computational environments (such as real-time systems). In sinusoidal modeling, the fixed, uniform filter-bank of the vocoder is replaced by a sparse, peak-adaptive filter bank, implemented by following magnitude peaks in a sequence of FFTs. The efficiency of the split-radix, Cooley-Tukey FFT makes it computationally feasible to implement an enormous number of bandpass filters in a fine-grained analysis filter bank, from which the sparse, adaptive analysis filter bank is derived. An early paper in this area is included as Appendix H.
Thus, modern sinusoidal models can be regarded as ``pruned phase vocoders'' in that they follow only the peaks of the short-time spectrum rather than the instantaneous amplitude and frequency from every channel of a uniform filter bank. Peak-tracking in a sliding short-time Fourier transform has a long history going back at least to 1957 [210,281]. 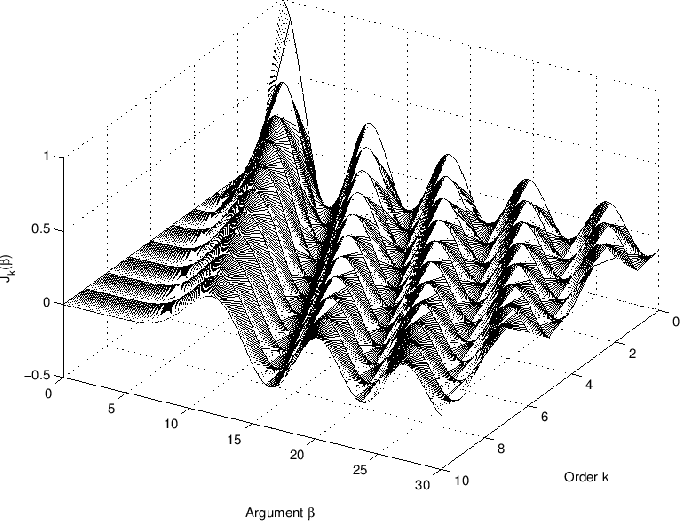 Sinusoidal modeling based on the STFT of speech was introduced by Quatieri and McAulay [221,169,222,174,191,223]. STFT sinusoidal modeling in computer music began with the development of a pruned phase vocoder for piano tones [271,246] (processing details included in Appendix H). As mentioned in the introduction to additive synthesis above (§G.8), typical systems originally used an explicit sum of sinusoidal oscillators [166,186,232,271]. For large numbers of sinusoidal components, it is more efficient to use the inverse FFT [239,143,142,139]. See §G.8.1 for further discussion. In the late 1980s, Serra and Smith combined sinusoidal modeling with noise modeling to enable more efficient synthesis of the noise-like components of sounds (§10.4.3) [246,249,250]. 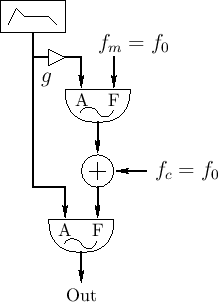 In this extension, the output of the sinusoidal model is subtracted from the original signal, leaving a residual signal. Assuming that the residual is a random signal, it is modeled as filtered white noise, where the magnitude envelope of its short-time spectrum becomes the filter characteristic through which white noise is passed during resynthesis. Prior to the late 1990s, both vocoders and sinusoidal models were focused on modeling single-pitched, monophonic sound sources, such as a single saxophone note. Scott Levine showed that by going to multiresolution sinusoidal modeling (§10.4.4;§7.3.3), it becomes possible to encode general polyphonic sound sources with a single unified system [149,147,148]. ``Multiresolution'' refers to the use of a non-uniform filter bank, such as a wavelet or ``constant Q'' filter bank, in the underlying spectrum analysis. The transient segment is generally ``spliced'' to the steady-state sinusoidal (or sines+noise) segment by using phase-matched sinusoids at the transition point. This is usually the only time phase is needed for the sinusoidal components. So, although sinusoids are sufficiently general thanks to Fourier's theorem the combination of sines, filtered-noise, and transient segments can provide a much more compact basis for audio signals. Such compact building-blocks for sound are useful for audio coding and manipulation. A relatively recent topic in sinusoidal modeling is time-frequency reassignment, in which STFT phase information is used to provide nonlinearly enhanced time-frequency resolution in STFT displays [12,73,81]. The basic idea is to refine the spectrogram (§7.2) by assigning spectral energy in each bin to its ``center of gravity'' frequency instead of the bin center frequency. This has the effect of significantly sharpening the appearance of spectrograms for certain classes of signals, such as quasi-sinusoidal sums. In addition to frequency reassignment, time reassignment is analogous. A 74-page summary of sinusoidal modeling of sound, including sines+noise modeling is given in . An update on the activities in Xavier Serra's lab in Barcelona is given in a dedicated chapter of the DAFX Book . Scott Levine's most recent summary/review is . Additional references related to sinusoidal modeling include [173,83,122,170,164,171,172,84,295,58,237,145,31]. We have profitably used many of the known properties of the inner-ear in our spectral models. For example, the peak-dominance of audio perception matches well with the ``unreasonably effective'' sinusoidal model. Similarly, as MPEG audio and S+N+T models show, we can inaudibly eliminate over of the information in a typical sound, on average. This experimental fact indicates the existence of a much sparser high-level model for sound in the brain. We know that the cochlea of the inner ear is a kind of real-time spectrum analyzer. The question becomes how is the ``ear's spectrogram'' processed and represented at higher levels of audition, and how do we devise efficient algorithms for achieving comparable results? Needless to say, there is much more that could be said regarding the time period covered above, and much more that could be added spanning the years since 2000. These are only some of the main highlights closest to the author's research.